Auroralight Announces New LPL7-SQ Quadrant Luminaires – Auroralight Inc.
(CARLSBAD, CA – September, 2018) Auroralight, manufacturer of the world’s finest solid copper and brass landscape lighting solutions is pleased to introduce the new LPL7-SQ luminaires. Featuring precision machined acrylic optics with a deep prismatic design that allows for uniform distribution from a single optic lens. 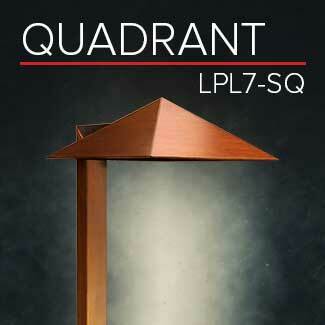 For more light output and forward light distribution, the LPL7-SQ is also available with a 7 watt light engine. Machined from solid brass, the LPL7-SQ Quadrant is built with the highest level of craftsmanship one comes to expect from Auroralight. The LPL7-SQ is a classic design re-engineered and manufactured to a quality and performance standard never before available. Featuring a heavy duty architectural brass stem ingeniously coupled to the robust die-cast brass hood with no visible hardware. Available in two distributions and wattages.